An established Christmas dessert made to resemble a yule log which is traditionally burnt on the hearth on Christmas Eve. 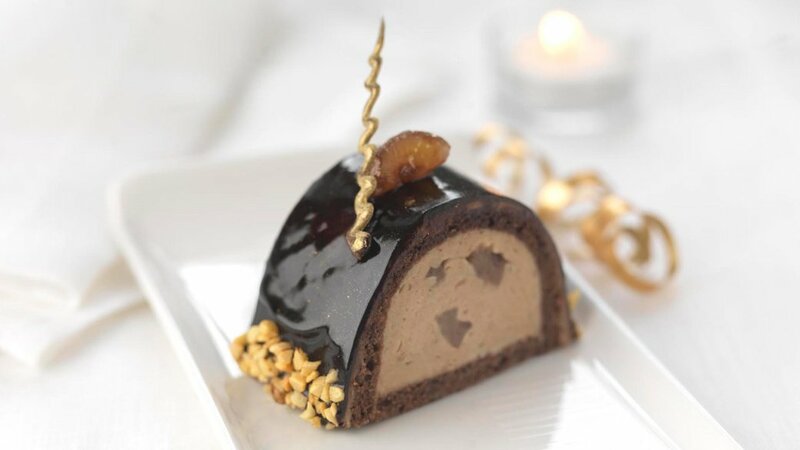 This modern version has a rich centre filled with chestnut cream which is encased with a chocolate “biscuit” sponge and chocolate glaze. Chocolate “biscuit” sponge: Preheat the oven to 180°c. Place the egg whites into a machine bowl and whisk on a medium speed adding the sugar gradually until a stiff meringue is formed. Blend the egg yolks and the oil together then fold into the meringue. Lastly fold in the flour and cocoa until evenly incorporated. Spread onto the silicone mat lined baking sheet. Bake until cooked through, about 12 to 15 minutes. Remove from oven and slide the silicone mat onto a wire rack, cover with a clean dry kitchen cloth and cool. Remove silicone mat only when ready to assemble. Rum syrup: Place the sugar and water into a pan and bring to a boil. Allow to cool and then mix in the dark rum. Chestnut cream: Place the chestnut spread into a mixing bowl. Add the butter and beat until smooth. Place the gelatine leaf into a bowl of cold water until softened, about 5 minutes. Remove the gelatine from the water and squeeze to remove excess water. Using the thermometer, heat the cream until it reaches 30°c. Add in the soaked gelatine and mix to dissolve. Gradually mix the cream into the chestnut mixture and finally add the rum. Place into a piping bag fitted with a 10 mm nozzle. Chocolate glaze: Place the gelatine leaves into a bowl of cold water until softened, about 5 minutes. Remove the gelatine from the water and squeeze to remove excess water. Transfer the sugar, water, cocoa and cream into a pan and bring to a boil. Remove from the heat and add in the gelatine, blend with a hand blender and then pass through a fine sieve. Refrigerate until ready to use. Nibbed almonds: toast the nibbed almonds in a dry frying pan until slightly coloured and aromatic, about 3 to 5 minutes. Allow to cool and cover with gold powder (optional). Chocolate spirals: Place the chopped dark chocolate into a bowl. Place the bowl over a water bath of simmering water. Do not stir; wait until you can see melted chocolate around the edge of the bowl. Remove the bowl from hot water and leave to stand for 2 minutes. Stir well until all of the chocolate pieces are combined. Place into a piping bag. Pipe spiral shapes out onto parchment paper and allow to set. Cover with gold powder (optional). Assembly: Trim the chocolate “biscuit” sponge into 2 rectangles; 1 x 30 cm by 10 cm and 1 x 30 cm by 5 cm. Cling film the gutter mould. Place the larger piece of “biscuit” sponge into a gutter mould, baked side down and brush with rum syrup. Sprinkle over the roughly chopped candied chestnuts then pipe over the chestnut cream until the mould is almost full. Smooth out the chestnut cream with a back of a spoon, pressing down to remove any air pockets and ensure the chestnut cream is about 1 cm lower than the “biscuit” sponge edge. Soak the smaller piece of “biscuit” sponge with rum syrup and place on-top 4 of the chestnut cream. Press down to level then refrigerate for 30 minutes. De-mould using the cling film onto a wire rack with a tray underneath. Brush the outside of the roll with the remaining rum syrup. Ensuring the chocolate glaze is cool to touch and thick enough to have a coating consistency, pour over the Yule log in one movement. Immediately flick with gold powder (optional). Refrigerate until set, about 30 minutes. Transfer from the wire rack onto a presentation plate. Use a knife dipped into hot water to soften the glaze down the sides of the log and coat the softened glaze with the nibbed almonds. Decorate with the remaining candied chestnuts and chocolate spirals. Slice and serve. This interpretation of a classic Christmas dessert spoils us for choice. There are so many beverages than can replicate the nuttiness and the chocolate present in this log. One could opt for mature Rum, Brandy or Whisky or even Tawny Port. It all depends how indulgent one wants to be at Christmas! After all, it is Christmas only once a year so we will chose to indulge in a fortified wine from Australia, a Non Vintage Campbells Rutherglen Topaque. This unique speciality from the Victorian Highlands is made using dried Muscadelle grapes and aged over a long period of time until it becomes of an enticing rich copper colour and tastes of dried fruit, toffee and chocolate. Nothing else to add, Merry Christmas!